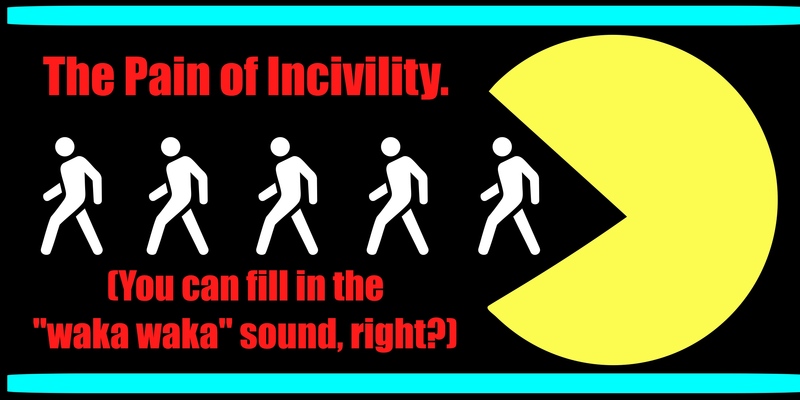 November 24, Incivility can truly be the end of us. By the way, please excuse my silly graphic, today. When I was growing up in church, in my little slice of the world, there was definitely a lot more emphasis placed on being right than on love. In fact, unfortunately, love could be withheld on grounds of someone’s doctrinal correctness. It’s not that there weren’t mavericks who did dare to love, even to love the people with questions and shaky doctrines, because there were! Thank goodness for me! We are called to be free agents, but with a choice. Our free will can be used to serve ourselves and our own wants and needs, or we can use our own free agency in humble service to one another, choosing paths that could mean the life or death of our communities and relationships. It sounds rather dramatic, but I have found it to be true. Biting and devouring the people around you is a sure fire way to be the last one standing. Call that a win if you’d like, but it sounds lonely and defeated to me. Civility calls us to building others up and meeting their needs by word and action, as does our love and freedom. So maybe civility is the responsible expression of freedom? I think that when we choose an uncivil path, one of judging and not loving, or as Paul so poetically puts it, as one of biting and devouring one another, we can expect to be consumed in the end. We may be free while tearing and biting, and having a bit fun and filling our bellies, but that freedom is being squandered, and it’s ultimately lost in the demise of our relationships and connections. This entry was posted in Civility, Devotional Thoughts and tagged Biting and Devouring, Civility, Community, Freedom.